Truckee Meadows Water Authority (TMWA) Board of Directors established the Truckee River Fund (the Fund) in 2004 as an innovative method of maximizing public funds for projects devoted to protecting the primary source of water for our customers. Through the Fund, nonprofit organizations raise funds to augment TMWA’s resources for implementing projects/ programs that benefit Truckee River water quality and watershed and thus, our customers. The Fund is held at the Community Foundation of Western Nevada, a tax-exempt 501(c)(3) nonprofit organization, but all TMWA funds remain in the sole control of the TMWA Board and all expenditures from the Fund must be approved by TMWA. What requirements must projects meet to be considered for funding? How does a project get approved for funding? Projects are solicited twice a year through an open and competitive Request for Proposal (RFP) process. Once applications are received, Fund advisors review each request and submit a list of projects that meet all the requirements to the TMWA Board of Directors. The Board reviews each recommendation at a public meeting and can approve funding or veto any project. Who makes up the fund's advisory committee? The Fund’s Advisory Committee has nine members. Washoe County, City of Reno and City of Sparks each appoint three representatives to the committee. Committee members cannot be elected officials. The Advisory Committee reviews project requests at noticed public meetings, prior to submitting their recommendations to the TMWA Board. Does this save customers money? Yes. Because funds are in a separate, tax-exempt foundation, TMWA requires that all projects have matching funds. This enables TMWA to complete projects at a much lower cost than if TMWA was paying the entire amount. If the fund goes away, will my monthly bill be lowered? No. Your bill was not raised when the Fund was created. Even if the Fund did not exist, these types of projects would continue to be implemented by TMWA to protect your water quality – only without the benefit of matching funds from other organizations. Why does TMWA use customer monies to fund projects that protect and enhance water quality of the Truckee River, or its watershed and raw water supply? Eighty-five to 90 percent of the water delivered by TMWA comes from the Truckee River. TMWA is responsible for providing customers with potable water that is safe, clean and meets all Federal EPA Standards. Proper management of the Truckee River is critical to insure such standards are met. The projects funded by the Truckee River Fund normally involve areas of the watershed that are multi-jurisdictional in nature which makes a watershed improvement project difficult, if not impossible, to implement by one entity or agency. However, the creation of a fund allows TMWA to secure matching funds and partnerships with other public agencies; thus, our customers spend less money to protect our river and our watershed. Since its inception in 2004, nearly $7.4 million has been approved for distribution from the Fund qualifying projects. Organizations provided additional matches of nearly $15 million in cash and in-kind services. The projects range from watershed restoration projects to invasive weed removal programs. 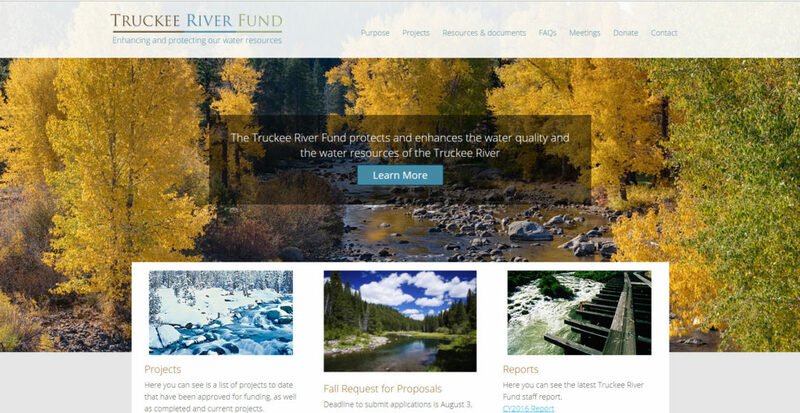 For a detailed list of all current and completed projects, including the project information and benefit to TMWA, visit www.truckeeriverfund.org.